It's about time I did a beauty related post for you all. I did a post not too long ago on my current makeup favourites but I am aware that I tend to use high-end makeup rather than drugstore. I had recently run out of my favourite concealer and so grabbed a drugstore alternative from my makeup drawers. After using it for quite a while I found that it worked just as well as my high-end concealer but was so much cheaper! This is what gave me inspiration to create a 'drugstore alternatives' post. So, let just dive right in. Primer - I am a huge fan of Benefit's Porefessional Primer but after using 2 tubes of it, I thought it was time to hunt for a cheaper alternative. I already own a large makeup collection so thought I'd try one of the primers I had in my collection already. I was very kindly sent the Wonderland Studio Finish Primer a few weeks ago and I wish I had stumbled upon this sooner! It has done wonders for my makeup routine and doesn't feel any different to what my Benefit primer felt like. Concealer - This is what sparked the idea to create this blog post. I had recently run out of my favourite concealer which is the NARS Radiant Creamy Concealer! It's been such a struggle trying to find an alternative but I finally found one. The Maybeline Instant Age Rewind Concealer is an exact dupe for the NARS concealer. It isn't as high coverage as the NARS one but it pretty close. The texture of Maybeline's concealer is incredible and it doesn't leave my skin looking cakey or dry. Surprisingly, another concealer favourite of mine is the Primark Concealer Stick! It doesn't even cost more than £1 but I find it works really well with my skin. I think the coverage is pretty good for Primark and it has a really smooth texture for being a stick concealer. Foundation - I would usually include a Foundation alternative here but in all honesty, my foundation favourite at the minute is already a drugstore product. This is the L'oreal True Match. I don't use foundation a great deal unless I'm going out so this foundation is good enough for me. If I want a little more coverage though, I do mix it with my Dermacol concealer/foundation as the coverage is insane in this product! Powder - I don't really wear powder just because my skin doesn't seem to get very oily and my makeup stays on pretty well after using primer. But, I do love the MAC Studio Fix Powder for when my skin is oily or I am going on a night out so I know I'll need my makeup to last all night. But, I feel that the Rimmel London Stay Matte Pressed Powder does just as good of a job if not better! I find that the MAC one can be quite cakey sometimes whereas I don't feel cakey at all when I'm wearing the Rimmel powder! Bronzer - I have yet to find an alternative for my Benefit Hoola Bronzer so if you have any alternatives then please let me know! However, sometimes I do use a Cream Bronzer and I find that Sleek do a really nice Contour Palette for a lower price than the Benefit Hoola Bronzer itself. Blush - I absolutely love my Zoeva Coral Spectrum Blush Palette and it isn't actually that pricey! I'm not entirely sure if Zoeva is High-End but it definitely seems like it is. An amazing dupe for some of the Zoeva blushes are the ones from Makeup Revolution. I'm such a big fan of Makeup Revolution as they do some amazing palettes for such a low price. They aren't chalky and the pigmentation is just as good! Highlighter - MAC Soft & Gentle is my all time favourite highlight but it is pretty pricey. I would say it's worth it though because it has lasted me quite a while! There are so many cheaper alternatives out there though which can be just as good. 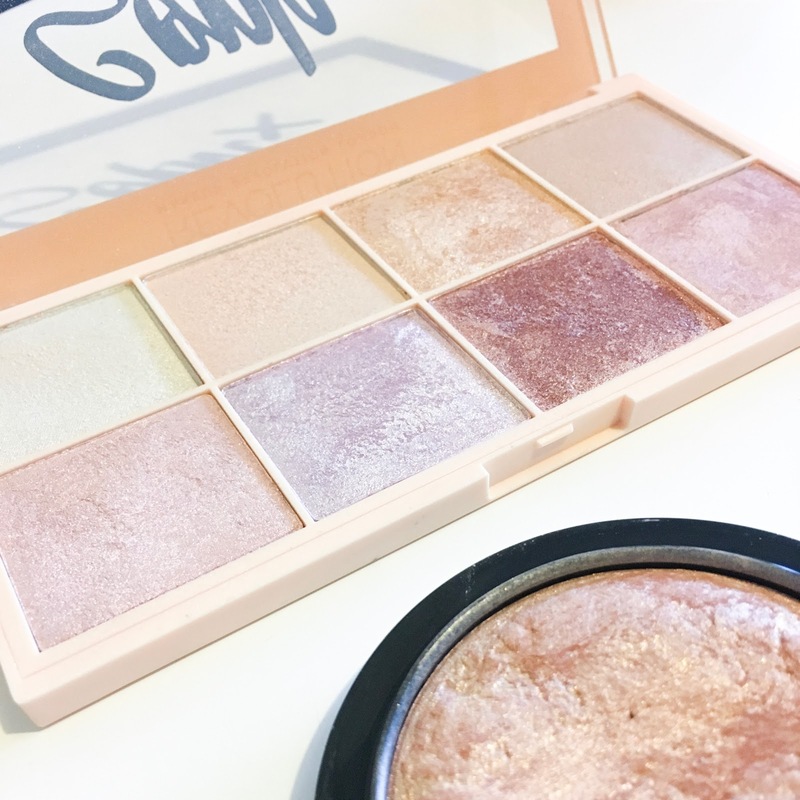 One of my personal favourites is the 'Soph x Makeup Revolution Highlighter Palette'. It comes with 8 different highlighter shades and they are all incredibly pigmented! I would highly recommend it. Mascara - I am not usually one to go for high-end mascara's just because they don't last very long anyway and it seems like such a waste to keep splashing my cash on mascara's when there are SO many drugstore ones out there! I think Rimmel London and Maybeline do the best mascara's, hands down! The Rimmel London Wonder'fully Real Mascara is the one I'm currently using and it is amazing! Wonderland Makeup also do an incredible mascara which is great for more natural but long eyelashes. I have used the They're Real mascara from Benefit as well as a few other high-end mascara's but I find that Rimmel is great too! 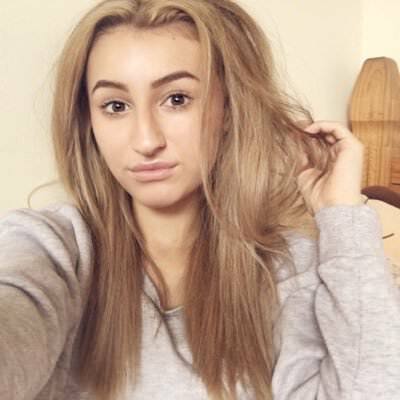 Eyebrows - I love love LOVE the Anastasia Beverly Hills Dipbrow as I know a lot of other beauty fanatics do! But, after bleaching my hair blonde I was determined to find a brow product that wasn't as pricey but was a good colour match for my brows. It's also gone up £4 too since I last brought one. I swear by the W7 Twist & Shape Blonde Eyebrow Pencil if you have blonde hair. It is such a perfect colour for me and the pencil glides on to my skin so smoothly! Another firm favourite of mine is the Profusion Cosmetics Eyebrow Pencil in Soft Brown. This is a little darker than the W7 one but still works just as good. These alternatives are so much cheaper and work wonders. 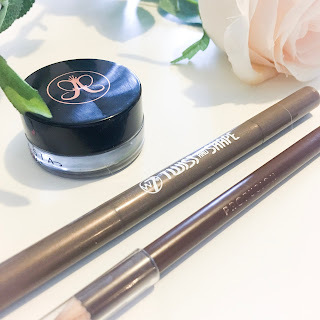 Profusion Cosmetics Soft Brown Pencil - £7 but this is for the whole Define Brows Kit! I'm not going to dive into eye-shadow and lipsticks just because I don't use these on a daily basis but if you'd like to see a post on this then just let me know and I'll happily do one! I really hope you found this useful and it saved you a bit of money if you were about to splash out on a high-end makeup product! * Some of the makeup products I mentioned were sent to me by brands. However, all opinions are my own and are not influenced by the brand I am working with. Wow, I'll have to give the Primark concealer ago! Hi, thank you for sharing these products as it’s great to have a cheaper alternative. Some of the brands I have not heard of before. I agree with the Soph x Revolution highlighter palette it's one of my favourites! I've heard great things about the Dermacol foundation but I'm yet to try it so I'll have to add it to my wishlist! Thanks for sharing these! I think I’m gonna into makeup more and see what works for me. I remember always using the Rimmel Matte Powder when I was in my teens. It’s so cheap but works just as well! ooo I love posts like this! I love finding cheaper alternatives for products that I love! definitely going to try the w7 twist and shape! This is such a helpful post. I'm always on the lookout for cheaper alternatives because I hate spending loads of money on make up. I agree with the previous comment re your photography skills! Wish I have your skills 🤗. I am probably the only person in the planet who is not a fan of the Maybelline concealer but I do agree with you on the Rimmel Stay Matte powder. I love love love that powder and am considering getting it again after I finish my current one. 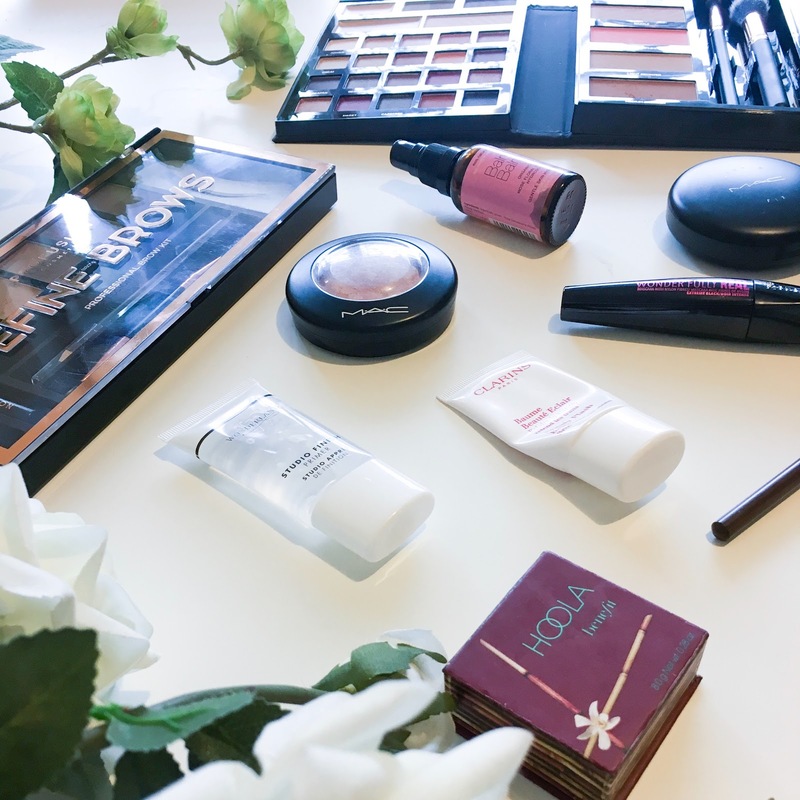 I have a real mix of high end and drugstore make up because I love mixing the two together! Have you ever tried the Collection Lasting Perfection Concealer? Its my fav! 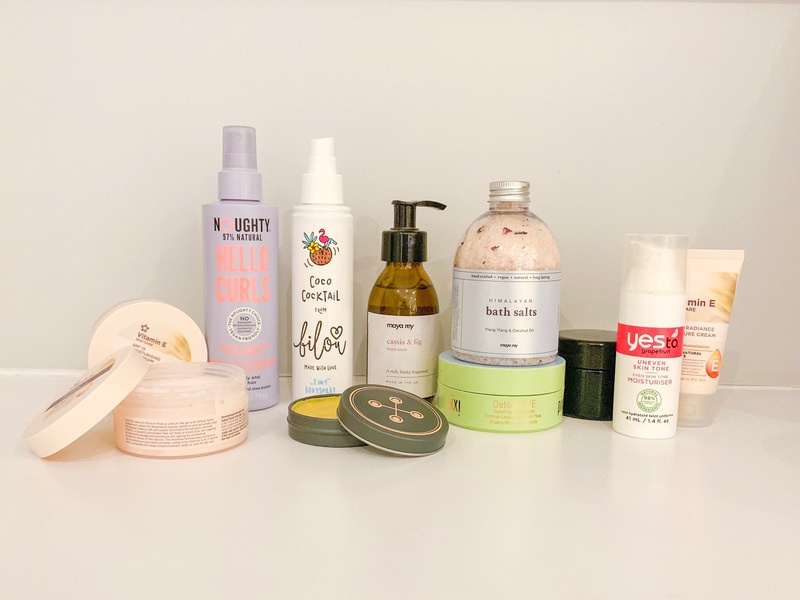 Saving this link to read later and try out some of the products you suggested! :) Did you end up doing a lip product one! ?